Spring is finally here and we already have many seeds in soil, taking root indoors in our school greenhouses! But our gardens need some work before we can get those seedlings into the ground. Please come out to help in the gardens on what we are SURE will be beautiful, spring Saturdays. Right, weather?! Saturday, April 18th from 9:00 am – 12:00 pm. 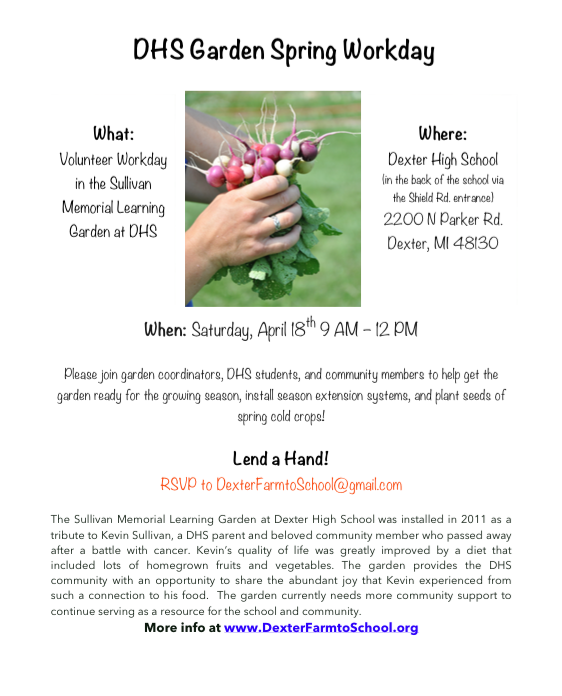 Contact Caitlin Joseph at DexterFarmtoSchool@gmail.com if you are able to help or have any questions. Meet in the garden, which is behind the school near the greenhouse. Saturday, April 25th from 9:00 am – 12:00 pm. Contact Laurel Livingston at laurellivingston@hotmail.com if you are able to help or have any questions. Contact Heidi Patel at heidipatel@charter.net if you are able to help or have any questions.